My adorable little Maltese, Emily, has been very busy! 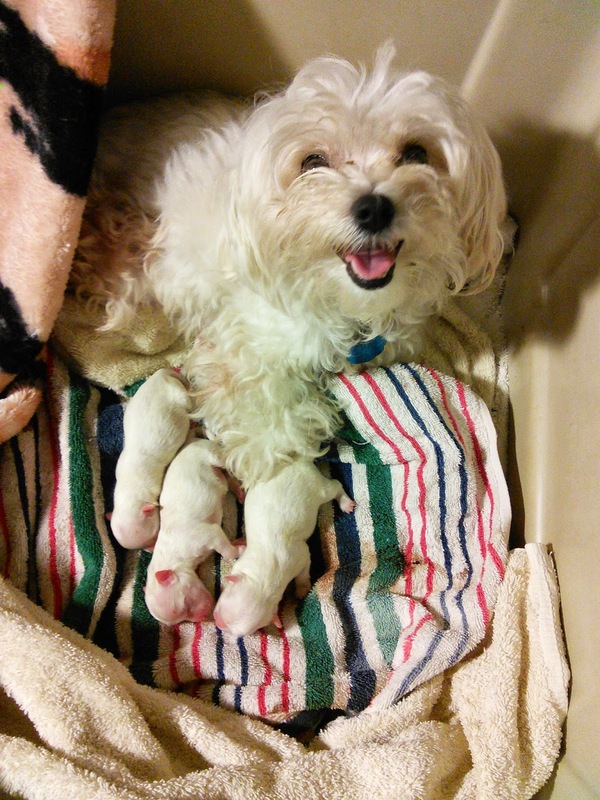 On October 25, she presented us with 3 BEAUTIFUL Maltese puppies! Did I mention they were beautiful!? They are going to be ready for their forever homes on December 20, just in time for CHRISTMAS PRESENTS! Being a first time mother, she had no clue what was going on when they were born. I could see the thoughts going through her little head - "What in the world is happening to me? I feel rather odd. I have been putting on a lot of weight lately. I don't feel so good. Whoa, what is going on here, what is this thing coming out of me?? OH MY GOD IT'S ALIVE!" Then instinct kicked in and she became the world's greatest Mom. The second and third puppies were like "Oh yeah, I've got this covered, I know what's happening now"
So without further ado - may I present Emily and the three cutest puppies in the world! From Left to Right - Little Girl, Little Guy & Big Guy all healthy, warm and clean! Hey!! Where Did The Painting Go?? Hey!!!!??? where did the year go??? ?